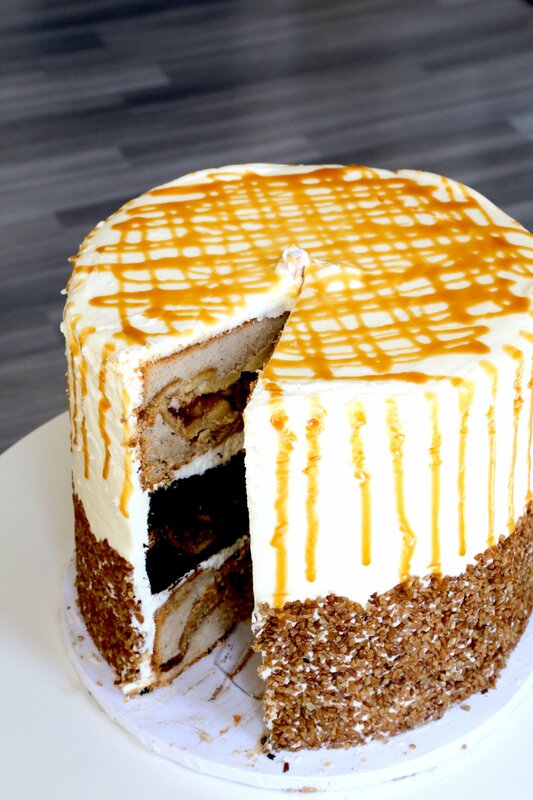 This whopping dessert features three pies baked into three cake layers for a Thanksgiving tower of deliciousness. 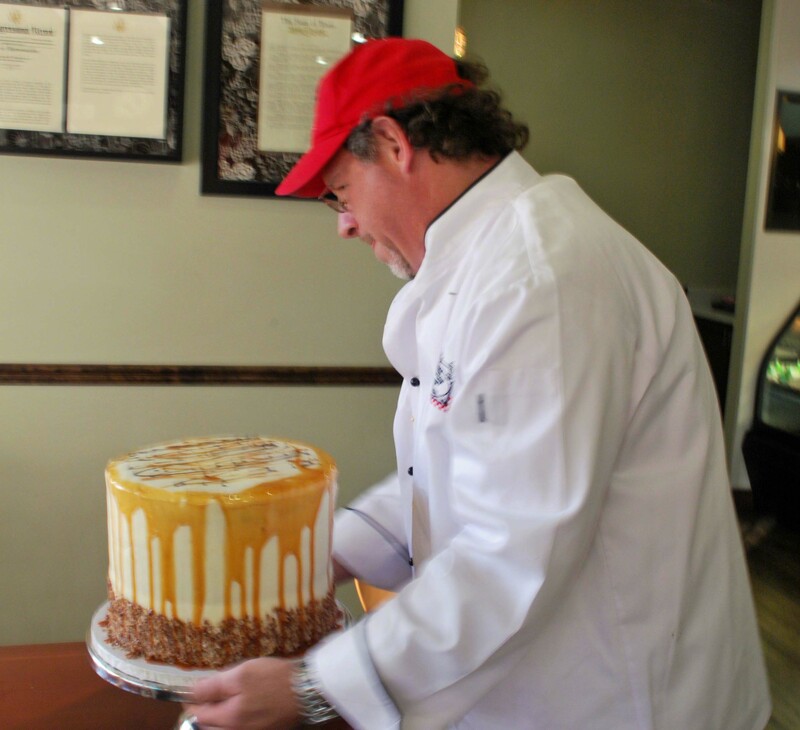 In the spirit of extravagant abundance, the Pumpecapple Pie Cake was invented by the Three Brothers Bakery in Houston, TX. The original confection is a sight to behold, but at $250, most of us couldn't afford to order one for a family dinner. Luckily, it's not that difficult to recreate with store-bought supplies and a bit of time. The most important thing when assembling a Pie Cake is your cake pan. Most commercial pies come in 8" or 9", so you're going to need an 11" or 12" cake pan to make this all work. 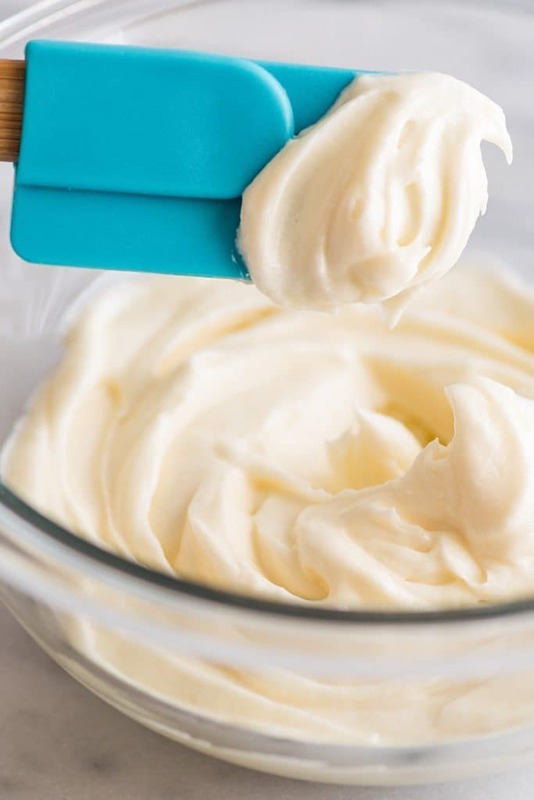 A stand mixer or hand mixer is also important because you're going to be making a ton of cream cheese frosting. For the purposes of this article, I'm going to assume you are making the cakes from box mixes and purchasing the pies. The only thing you're making from scratch is the frosting. Start at least two days in advance and plan on freezing your layers. You don't need anything spectacular for the pies, but it looks nicer in the end if they are all the same size. The 9" pies are the easiest to find, so use those with your 11" or 12" cake pan. Prepare your boxed cake mix, butter and flour your cake pan, and pour in enough batter to cover the bottom. Gently remove the pie from its tin and set it in the cake batter, face down. Pour the rest of the cake batter over the pie and around the sides of the cake pan. You will not have to use all of the batter; remember, it will rise. Bake according to the package instructions, cool, and carefully remove from the cake pan. Wrap each layer in two layers of plastic and freeze until you're ready to assemble your cake. Layer 1 will be pumpkin pie in spice cake. Layer 2 is pecan pie in chocolate cake, and Layer 3 is apple pie in spice cake (you can grate in a peeled apple to make it apple spice cake). I like to make my frosting a batch at a time. If you simply multiply the ingredients and try to mix it, you will end up with lumps. For the final product, you'll need about 4 batches of frosting, more if you want to do some elaborate piping for your decorations. Start with the butter and cream cheese at room temperature and mix all of the ingredients. Start with 3 cups of powdered sugar and keep adding until you like the sweetness. Once it tastes right, mix/whip on high for about one minute to ensure a smooth finish. Store in a zippered bag in the fridge for up to a week. Repeat until you have 4 bags of frosting. To assemble, carefully trim the cake layers as flat as possible -- remember, the pie was facing the flat bottom of the cake pan. Pipe a good amount of cream cheese frosting between the three layers (stack them with the chocolate layer in the middle). Carefully insert 3 bamboo skewers through the entire cake before frosting, about an inch from the edge so you're not piercing the pies. Cut off the protruding ends of the skewers and frost the entire tower. I like to keep it simple and just do some flower-tip flourishes on the top of the cake, accented with some Lindt white chocolate truffles. You can hide a messy frosting job by pressing in some graham cracker crumbs or crushed nuts like they do on the original cake. A plastic charger makes a great disposable platter for one of these hefty desserts -- make sure you get a sturdy one! The original pie cake is sold out for Thanksgiving 2018, but check the site if you want to order one for Christmas! Have you ever made or had a Pie Cake? 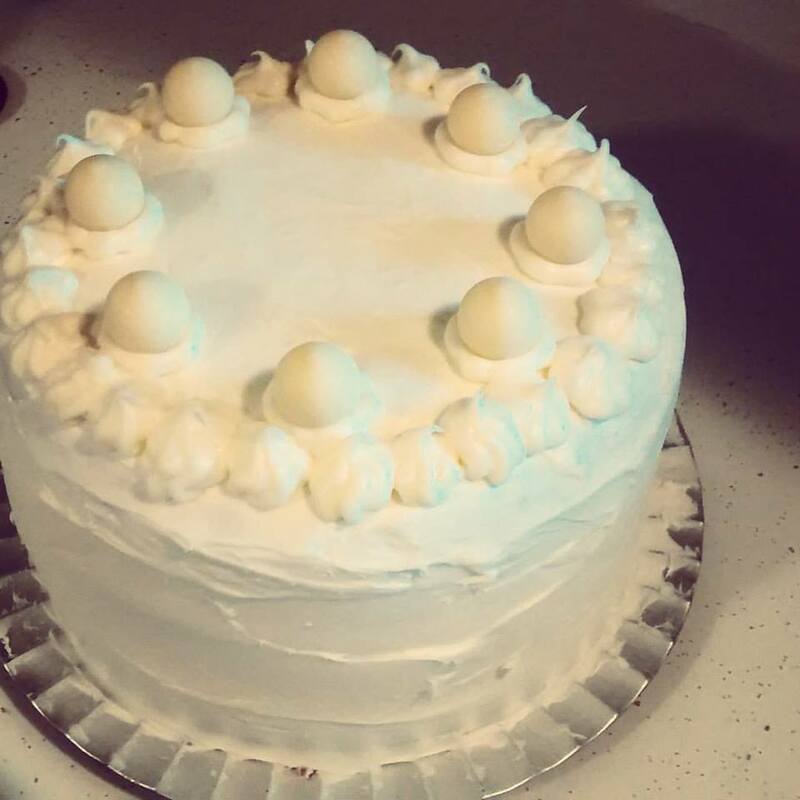 Any tips for first-time bakers that I might have missed? Let us know in the comments below. Are you stressed about Thanksgiving prep? Here are some dishes you can make in advance!